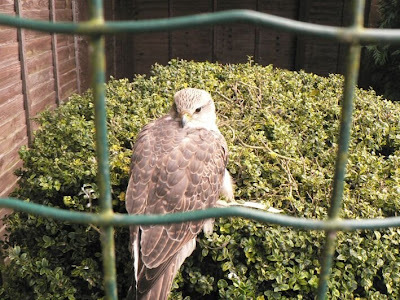 New Adventures in a Shambles: Birdies, birdies and more birdies! Birdies, birdies and more birdies! So the other weekend we found ourselves stuck at home and wondering what to do for the day as (for a change) it was sunny. 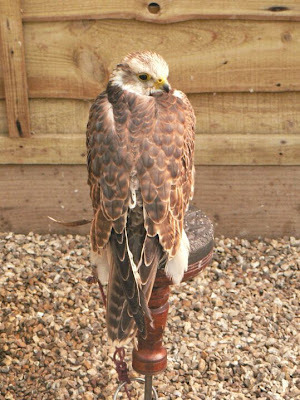 We decided to take a walk to the local Bird of Prey centre, Huxley's Bird of Prey. 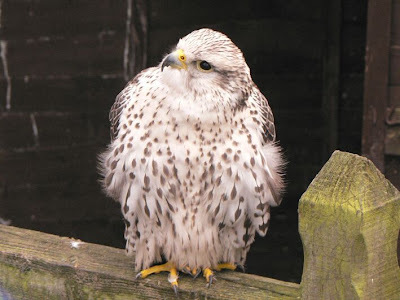 (www.flyingfalcons.co.uk). It was a little bit of a hair-raising walk as we found ourselves without a footpath at one point, but it was worth it when we got there!!! 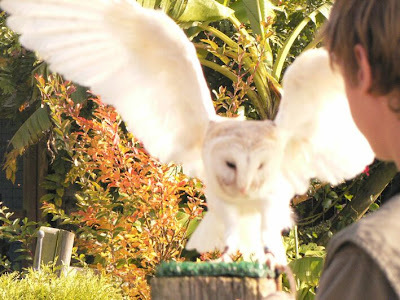 The top owl in the photo is Little Mo, who was not, by any stretch of the imagination, little!! 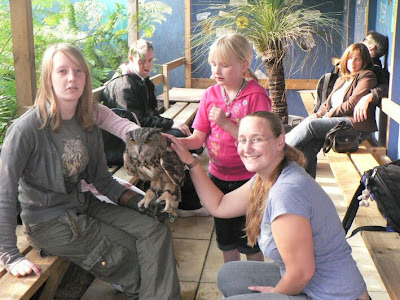 The middle girl is Katy, who was very vocal, most of their owls are imprinted when hatched which means that the first thing they see when they open their eyes is a human. Katy believes she is human and therefore likes to talk to people!! 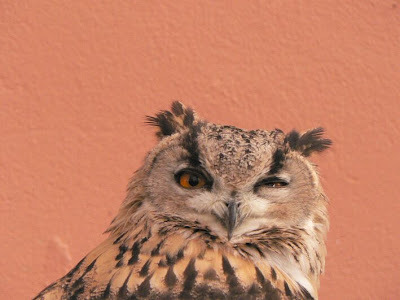 The bottom owl is Igor (yeth mathter). Igor has a bit of a sad story attached to him. . .He was bought as a present for a child (way before Harry Potter which just goes to show that people don't need suggestions to do dumb things, they can do it all by themselves). 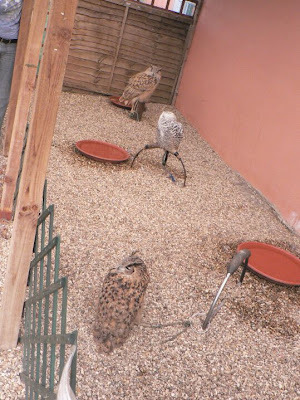 The family in question didn't really know how to look after an owl so he was left tethered outside with no shelter and occasionally fed dog food (or something equally un-owl-like). There was a gap in the fence next to him and schoolchildren would throw stones at him on their way past. One of the neighbours contacted the RSPCA who in turn contacted Huxley's and they came and rescued poor Igor. 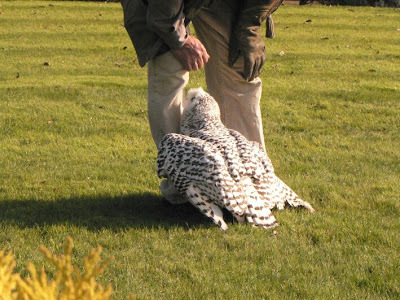 Igor is still frightened of many other birds of prey (as they would obviously have picked on him when he was unprotected) and cowers when he hears one of them calling. He is also afraid of the dark (an owl afraid of the dark, isn't that the saddest thing you've ever heard???) and when they take him on shows and it starts getting dark, they have to put him back in his carrier where he feels safe to calm him down. Anyway, at least his story has a happy ending because the nice people have given him a home and lots of cuddles and he is very loved now!! You may notice that some of the birds are tethered where they are. This is not as cruel as we thought it was! 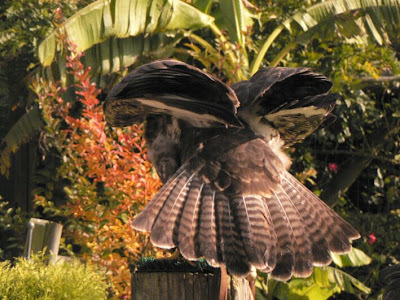 There was a flying demonstration and during that we discovered that many birds of prey are actually just plain lazy. They will only fly a certain amount and then they'll start waddling around on the ground! So having them tethered is pretty much the equivalent of what they would be doing in the wild anyway. This was done for a celebration of China's "Anniversary day", the 59th year since they became a communist country. BAD CHINA!! 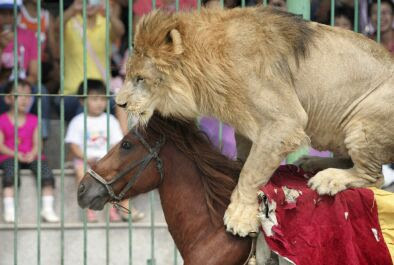 Poor horsie and kitty just not meant to do things like this!!! ANYWAY, onto one of our OTHER favourite parts of the whole experience! MEETING IGOR!!!! Yes, those feathers really are as soft as they look!! 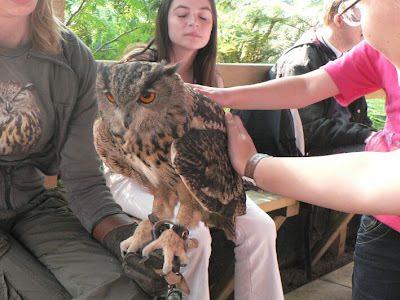 And he has ticklish feet which means that if you pat his feet, he'll start pecking (gently) you to make you stop. The top one is Igor doing his impression of Amber when she first wakes up (she's never able to open both eyes at once first thing in the morning, or after surgery which really freaked out the nurses in recovery!!) the bottom one is "Little" Mo, Mum - see his breast feathers? 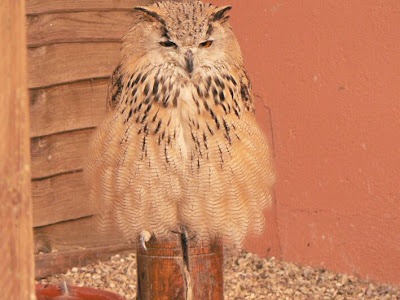 Little Mo is a Siberian Eagle Owl (not a scandinavian eagle owl like Amber keeps saying). Ok, so none of them are actually flying in any of these, but that's cause it's really hard to take photos of birdies flying cause they're quite quick!! The bottom photo is Katy who at this point had had enough of flying and was talking to her "daddy" about how he should really just feed her now. The top one is Bramble the Barn Owl who knows the routinue really well and will start flying about his aviary in a really excited manner just before the demonstration time! Also, all fans of the Labyrinth should recognise that shot. . .the middle photo is of a Harrier Hawk, it's just landed and is settling it's feathers back down, Harrier Hawks are unique because they can be flown for a hunt and still fly for "dead" meat as well, Falcons and other Hawks will refuse dead meat if they have tasted "fresh" meat and killed. Anyway, if any of you have been watching International Weather forecasts, you will be aware that some parts of England are already getting snow! Where we are has had a snow warning already and for the last two years snow hasn't fallen here until well after January. They turned on the COLD weather for us! Ok, now that we have caught you all up, we have to dash to town. . .love and hugs to all! The Capitol Horsham. . .